Tip: When you buy fresh ginger, you never use the whole freaking thing in one recipe. What I do is use what I need, and then freeze it. Just stick it in a plastic bag and throw it in the freezer. I never defrosted it before using it, because you can still peel it and cut it fairly easily even while frozen. That way you're not wasting it and it doesn't mold like it does in the fridge. Another tip, I always keep a big jar of roasted peanuts in the pantry. I prefer unsalted, just so they are not affecting the salt content of the dish. I sprinkle them on many asian dishes and they are just handy to have around, because I found myself using them more than I expected. 1. 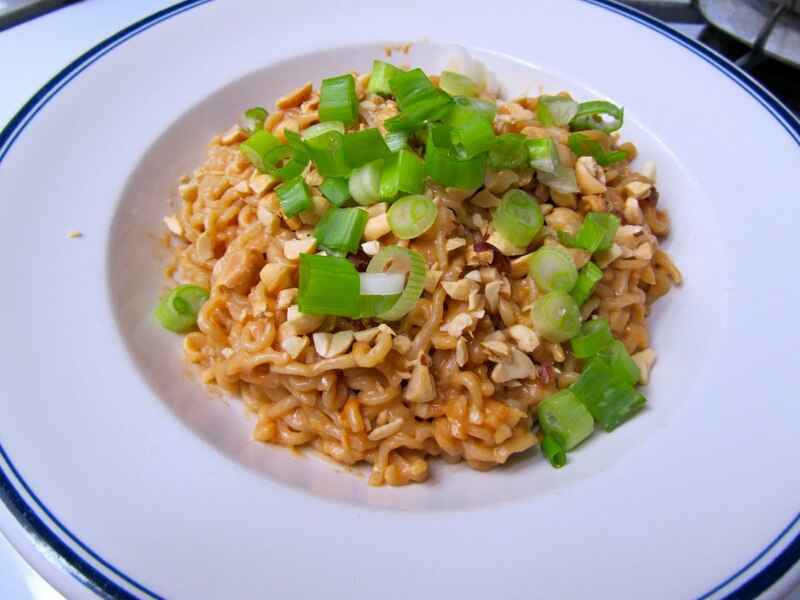 Place the peanut butter, garlic, ginger, soy sauce, brown sugar, sesame oil, rice vinegar, and chili oil into the bowl of a mini-food processor. Process until the mixture is well combined and forms a paste, 1 to 2 minutes. With the processor running, gradually add the chicken broth and process until the sauce is creamy and well combined, 1 to 2 minutes. Transfer to a large mixing bowl, cover, and set aside while you prepare the rest of the dish. 2. Place 4 quarts water into a large pot and bring to a boil over high heat. Add the noodles and cook until al dente, 1 to 1 ½ minutes. Drain thoroughly in a colander. Add the noodles to the bowl with the sauce and toss to combine. Serve topped with the peanuts and scallions.